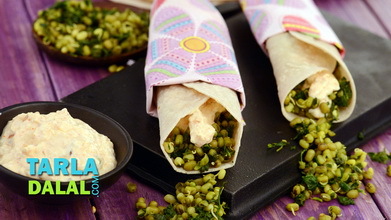 I love this one because it is simple and nutritious! 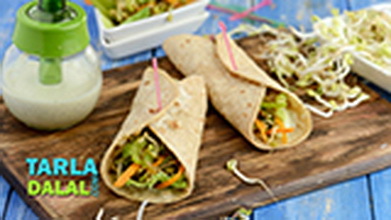 this no-fuss wrap is rich in anti-oxidant rich veggies like tomatoes, spring onions, carrots, bean sprouts and lettuce that help reverse ageing. 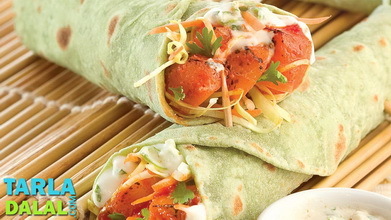 Not only is this wrap nutritious, it is also luscious due to presence of fresh herbs like coriander and mint. 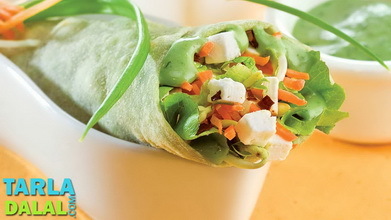 Wrap it up in a spinach roti for that fresh green look! Heat the oil in a broad non-stick pan, add the onions and sauté on a medium flame for 1 to 2 minutes. Add the garlic, kashmiri chillies and sauté on a medium flame for 1 to 2 minutes. Add the tomatoes and approx. 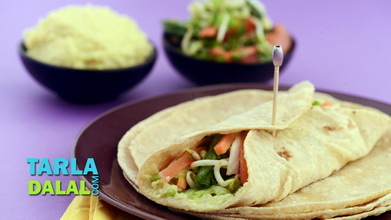 2 to 3 tbsp water, mix well and cook on a medium flame for 5 to 7 minutes, while stirring occasionally. 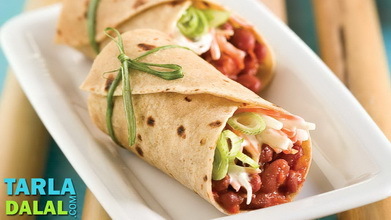 Add the tomato ketchup, spring onion greens, coriander and salt, mix well and cook on a medium flame for 1 to 2 minutes. Use a potato masher to lightly mash the mixture and keep aside. 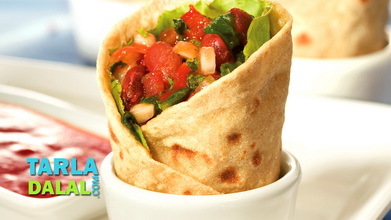 Place the roti on a clean dry surface and spread 2 tbsp of the tomato-garlic chutney evenly over it. 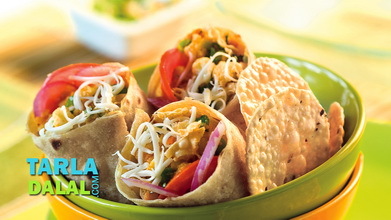 Arrange 1/4 th of the salad and spread 1 tbsp of mayonnaise in a row in the centre of the roti and roll it up tightly.